This is a statement I hear often from those who don’t have speech analytics, as well as those who do. Speech analytics has the potential to transform an organization and its relationships with customers, but organizations seldom harness its power to make that happen. The reason is the journey to speech begins without adequate planning, preparation and understanding of how to use the technology. Typically, speech neophytes start off by using it to grab low-hanging-fruit issues in an attempt to show ROI. After this fruit is picked, they run out of quick-hit ideas and get bogged down in what to tackle next. While speech analytics can solve some agent problems, restricting ourselves only to agent problems devalues its potential. Until we see “problems” as more than just agent issues, we won’t leverage the power of speech analytics to solve many other types of enterprise problems. Once this concept sinks in, it will open up a whole new world to you, and speech analytics will become the first tool to reach for – whether it’s a large scale project or quality monitoring. If you’re new to speech analytics and are beginning to assemble a vision but aren’t sure how speech analytics will fit into your organization, it’s paramount that you craft a blueprint for its use. Otherwise, you might find yourself struggling in only a few months and speech analytics could end up being a piece of shelf ware and that’s a surprise no one wants to see. MainTrax is a leading provider of speech analytics professional services to end users and industry partners. Free of allegiance to any one solution or supplier, MainTrax has earned a reputation as an independent, unbiased resource for consulting expertise across a variety of products and providers. Speech Analytics: Houdini or Whodunit? Speech and text analytics for the real world. Skinny Dipping – Part II. 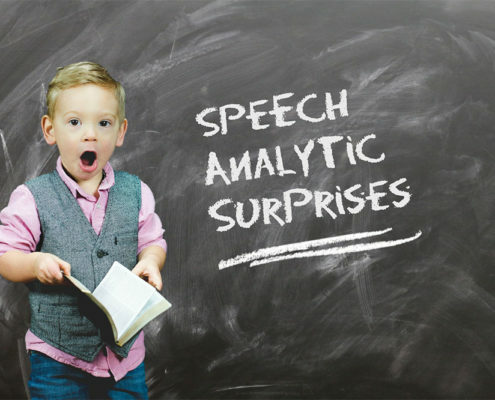 Speech Analytics Skinny Successes Speech Analytics: Houdini or Whodunit?